April Fool’s Day is my very least favorite holiday. There is certainly a place for silliness and giggly tricks. We have friends who do silly things like draw mustaches on family pictures with those erasable markers you use on a whiteboard. One year we went to the library to learn how to make fake vegetables with frosting. I’m not so boring that I don’t see the fun in a little lightheartedness. However, tricks and cleverness can go wrong pretty quickly, and maybe I got burnt one time when I was a little kid from something someone else found funny. What kind of cleverness and silliness do you find funny? How do you know when cleverness and silliness has gone too far? Samson, our Judge of the week, was clever. He liked tricks and riddles. Samson’s story is one where we can see that cleverness is both a good thing and something that can go awry pretty quickly when we forget that the Lord is the Lord of our brains as well as our hearts and lives. Samson’s life started off devoted to God. His mom and dad even had an Angel of the Lord visit them to tell them they would have a baby even though they hadn’t been able to have a baby before and that baby would be special, or set apart for God’s work in a very special way. In all the many stories about Samson in the Book of Judges in the Bible, you’ll find many riddles regarding these and other feats. Sometimes the riddles are good — a play on words against the enemy — but other times you get the sense that Samson knows he’s clever and isn’t really seeking God in order to use his cleverness for good. Is our cleverness for good or to make ourselves look good? Samson’s cleverness would eventually get him into trouble when he meets Delilah. There are a thousand storybooks which tell the story of Samson and Delilah. They are almost as famous as David and Bathsheba! More importantly, though, God teaches Samson to return to Him and ask for forgiveness in his weakness rather than in his strength. Samson’s strength is cool and God did cool things with it to begin overtaking the Philistines who led people to worship false gods rather than the One True God. Samson’s brain is cool, your brain is cool, and God made our brains to do cool things and think clever thoughts, but if it’s hurting people rather than helping people, we can turn to God and ask for forgiveness. Confessing our sins sounds weak, but really it’s one of the strongest things we’ll ever do. Samson turned to God, confessed his sins and God gave him strength to overcome the enemy by sacrificing his own life. He pushed down the pillars of a false temple and, in this way, Samson, the final judge we’ll hear from in the Book of Judges (although not quite the final judge over Israel), points us to the final judge of our study - Jesus. Jesus sacrificed for us. He died on the cross and it’s the single strongest thing a person has ever done. Stronger than Samson. God uses Jesus in us to help us to sacrifice and show people His mighty love - whether that’s the sacrifice of our asking for forgiveness, our helping someone when we have other things to do, or our sharing something or sharing friendship. Strength in sacrifice - now, that’s clever of God, don’t you think? Art by Adam Boggs at AKB Comics - find more of Adam’s work here. Actually, all heroes are imperfect, except Jesus. Batman had a darker side. Spiderman was kind of young and impetuous. Ironman was pretty prideful and thought he was super awesome. The Hulk’s entire superpowers revolved around anger and frustration. Captain Marvel mistook the bad guys for the good guys and the good guys for the bad guys. Of course, those heroes aren’t real, but Jesus is. God sends real people into our life also, to be real heroes when we need them because the world is sometimes a hard place to live. Real heroes have struggles too. Policemen make mistakes. Firefighters do too. So do moms and dads, grandmas and grandpas, teachers and nurses, and yep…everybody who isn’t Jesus. Jesus was perfect, so we don’t have to be. 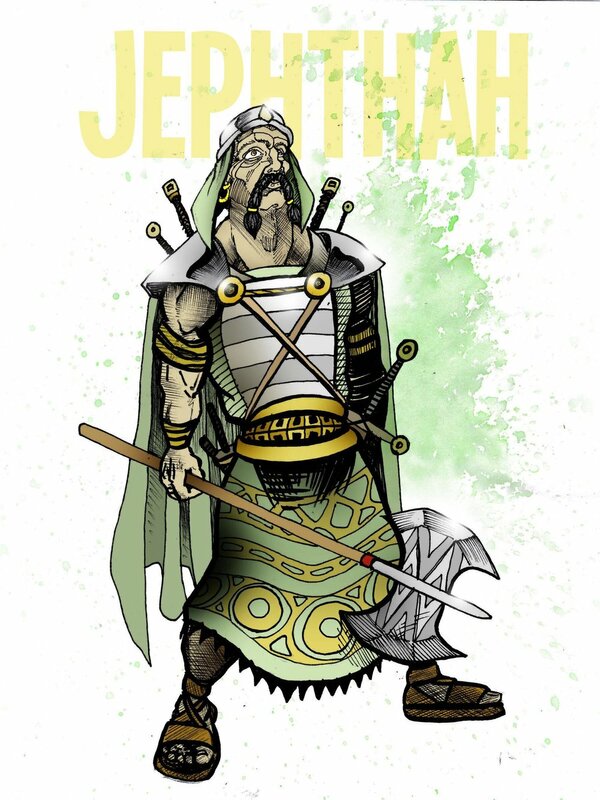 That’s one reason why we can celebrate our pretty messy hero of the week – Jephthah. Jephthah comes from a pretty difficult family. His parents married other people and he ended up with brothers who didn’t like him and threw him out, leaving him homeless. Then, the people of his town, and maybe his own family included, asked him to come back and defeat their enemy for them. Jephthah asked to be their judge instead and he led them to conquer their enemy by God’s power. However, remember…heroes, besides Jesus, are always imperfect. Because he wanted to thank the Lord for conquering the enemy, Jephthah made a rash vow. He ended up hurting the people closest to him, his family, instead of truly honoring the Lord. I’ll spare you the R-rated details, but sufficed to say, Jephthah killed someone he loved, essentially doing the same thing or worse to his family that had been done to him when he was younger. When we are rash with our words or our thoughts, our actions or our ideas, we can simply ask God for forgiveness rather than continue to do things that hurt others. Lord forgive us. Thank You for sending Jesus, who was perfect, so we don’t have to be. In His name we pray, Amen. Have you ever needed to fix something? Like a favorite toy or a Lego that wouldn’t go together or come apart the way you wanted it to? Maybe something in your car broke – a tire went flat or a spark plug stopped doing its job, a door wouldn’t open? Or your house – the water won’t go down a sink right or someone accidentally broke a window, or maybe just a lightbulb went out way up high? Things break, things stop working, things need cleaning and attention to get them working just the way we want them to. When Tola and Jair showed up in Israel, there was a lot broken. There wasn’t necessarily broken refrigerators or furniture in their houses, but big broken things, like broken leadership, broken systems for who makes what decisions, broken relationships, and especially broken understanding of who God was and what He wanted for His people. There are so many broken things in life because sin exists and there are so many broken things in our life because we are sinful people. God doesn’t always fix things. God does send help though. God sent Tola and Jair to help the Israelites remember who God was. God sent Tola and Jair to help the Israelites remember what God had done for them before. God sent Tola and Jair to help the Israelites remember who was their leader. Statues couldn’t lead them - fake gods, and false worship couldn’t lead them. Only God could lead them and help them face their enemies who wanted to hurt them. How does God help us, even when He doesn’t fix things we want Him to fix? He sends Jesus to be with us. He gives us heaven and the new creation where things will be fixed forever – our houses, our toys, our relationships, and especially our sin and sadness. He gives us songs and worship to help us remember Him. He gives us the Bible and prayers so that we can talk to Him. Jesus is a Mighty Helper and He makes Tola, Jair, you, and me helpers in this world too. Where is He sending you to help today, Mighty Warrior? Lord, You are our Mighty Help and You save us from our sins. Thank You for coming to rescue us at just the right time. Thank You for sending Your Spirit to help us every day. In Jesus’ name, Amen.